I've been away from blogging for a while because we spent a few weeks at the Veteran's Home where my father in law, Jim, was struggling with kidney failure. The family was at his side continually sharing our love and goodbyes with him. He entered his heavenly home on July 31st a few days after his birthday, July 24th. This picture of my husband, Rick, holding his father's hand during those difficult days reminds me that our parents take our hands when we are children to guide us through life and we then grasp their hand as they leave our lives. 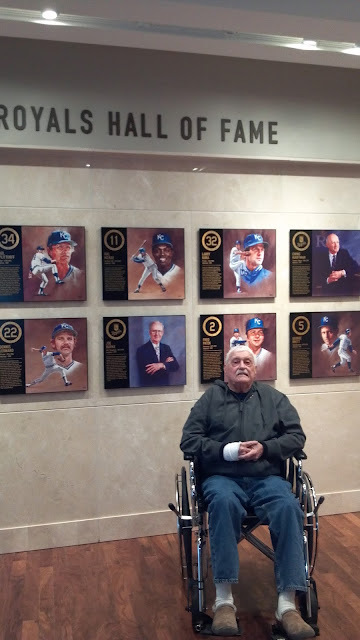 Jim had a stroke 5 years ago and went to live at the Veteran's Home in Cameron, MO where he was surrounded by the most loving family of care givers I have ever met. We hear so many horror stories about Veteran's hospitals and the wait time, but I'm happy to report that this beautiful Veteran's Home is a haven to our military veterans. They are treated with dignity and respect from the cooks to the nurses. 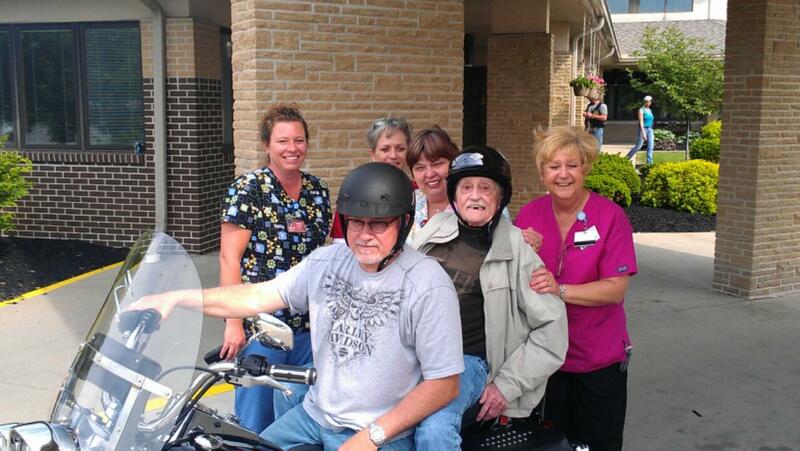 One of our favorite memories was when a veteran motorcycle group came to visit at the VA home. Rick decided to ride his Dad's Harley knowing the group would be visiting with their motorcycles that day. 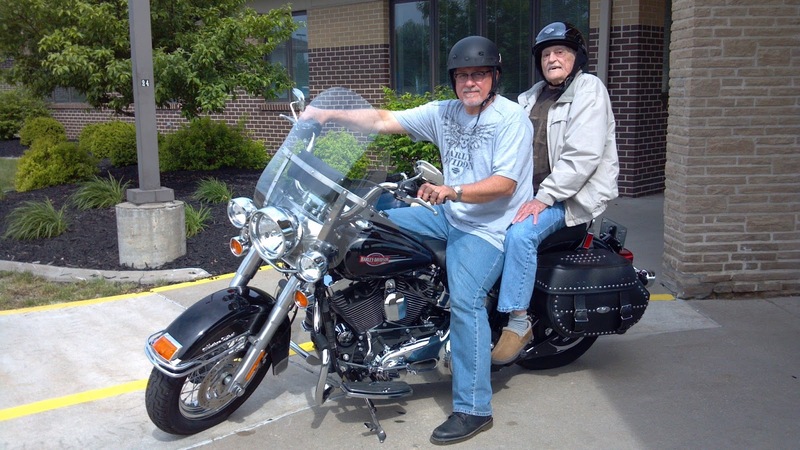 He wheeled his dad's wheelchair out to see all the cycles and Jim immediately began tapping his chest and pointing at his bike which meant he knew it was his. Rick asked his dad if he'd like to go for a ride and one of the guys loaned him his helmet. Rick forgot to sign his father out, but the nurses were standing there cheering them on when he returned. The VA home would take the guys fishing at a local lake. 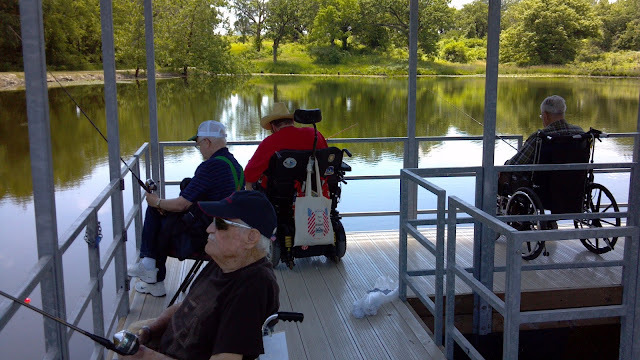 Jim lived his retirement years in Rockaway Beach, MO and was an avid fisherman. 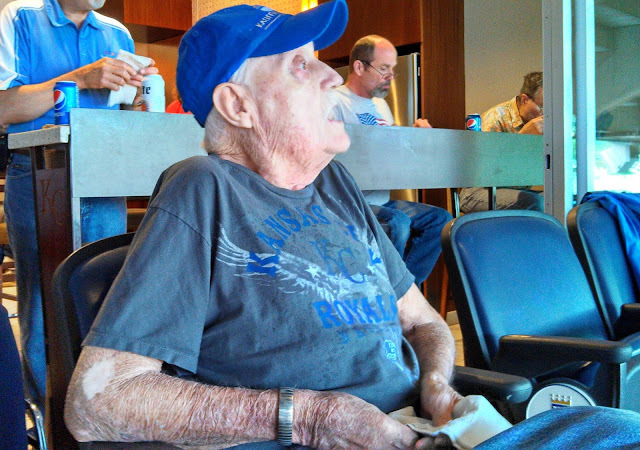 A couple times Jim signed up to go to the Royal's game and the veteran's were treated like royalty. They were given a suite, a tour, and tons of food. Jim wanted to sit outside the suite. At the Cameron Missouri Veteran's Home when a veteran passes a bell rings with the announcement and then the staff and saluting veterans line the halls as the deceased, draped with a flag, is wheeled out of the building while taps is being played. I'll never foget that final salute to my father in law. We will return to the Veteran's Home to visit with the guys because we love the staff and our wonderful veterans. Rick spent four years traveling 40 minutes to Cameron and back each night after work and most weekends. He was very dedicated to his dad and made a lot of friends there. I couldn't be more proud of him. We love you Jim and will be with you again someday. Thank you for posting this. It was lovely. Uncle Rickie is quite a man that I know Grandpa Jim and Grandma Ruby are very proud of. Couldn't ask for better to my thinking. Grandpa was a remarkable man and is missed dearly. Love to you guys. Always. 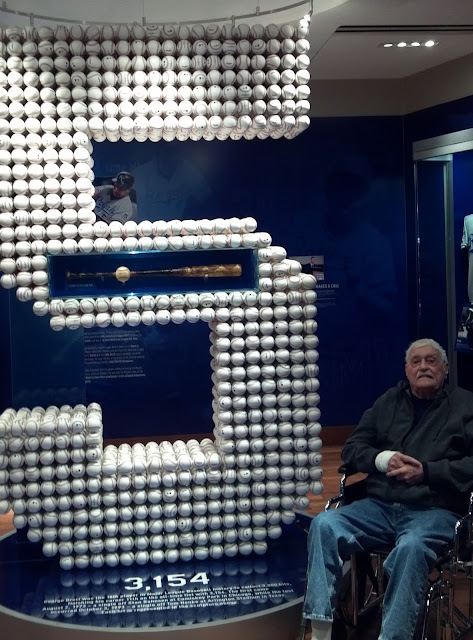 Rest In Peace Grandpa! Love you forever. What a sad and special situation, so glad your father in law had such a special farewell, well deserved. What a beautiful post about your father-in-law, Catherine. I'm so sorry for your loss. May he rest in peace.